Good news for John Cena fans that have been inspired by his “Never Give Up” style mottos over the years – you can now rock Cena’s style in the gym with this brand new line of John Cena training apparel! From t-shirts and hoodies to towels and gym bags, the CENA line has something for everyone including women and kids as well! Say what you will about John Cena’s character on WWE TV, but there has never been any question about his work ethic in the gym. 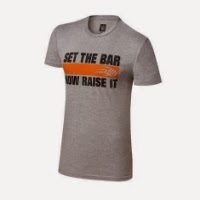 While there have been endless Cena shirts for his fans to represent what he wears on WWE programming, this is the first time fans can represent John Cena’s mentality in the gym as well. Why is Ricky Steamboat Not Still Wrestling?? ?